Chronic inflammation: Prolonged and excessive inflammation is not part of the normal inflammatory response process that occurs every day in the body. Chronic inflammation creates toxic chemicals that “eat away” at body tissues and upset your body's natural balance! This exclusive complete nutrient system - called Total Balance Women's Premium - is tailored to fit the specific nutritional needs of women - at every age and health level! As new, proven research comes to light - we continue to enhance and fine tune the Total Balance Women's Premium formula to deliver the optimum doses and cutting edge nutrients your cells need to thrive! Now, in its 8th generation of formulation - you can be certain our exclusive Total Balance Women's Premium formula - delivers a superior and Complete Nutrient System - with 97 targeted vitamins, minerals, enzymes, amino acids and age-defying nutrients to support cell health and function! 300% more age-defying nutrients than our Total Balance Women's Standard! That means greater cellular support and more antioxidant power for extra age defying! Yes - a whopping 300% more age-defying nutrients are added to this premium formula to help you fight off the appearance of wrinkles and fine lines... tighten skin... and support the youthful function of your entire body! This formula delivers the PREMIUM nutrients at the MAXIMUM dosage for OPTIMAL health and wellness! Optimum and natural hormonal support during menopause! Contains Wild Yam extract to support balanced estrogen levels naturally. Also contains Dong Quai to support hormonal balance during menopause - and help restore vitality and harmony to your body. The combination of the other herbs in the formula support temperature and mood balance! PMS support - and more! The specialized herbal extract blend contained in this formula supports PMS discomfort such as bloating and irritability during the menstrual cycle! For example: Feverfew extract contained in our formula helps support temperature balance and inflammation management, which may reduce headaches. Chasteberry extract can support the level of progesterone which can help normalize the menstrual cycle! Women-specific nutrients for health and vitality! With the natural and potent nutrients included in Total Balance Women’s Premium - it's like getting an additional bottle of women-specific nutrients to help you experience health and wellbeing before... during... and after menopause - without taking more pills or purchasing additional supplements! You get it all in Total Balance Women's Premium! Complete Nutrient System for optimum cell health! You get 97 potent vitamins, minerals, enzymes, amino acids and micro nutrients to feed your cells - at the right time - for cell health and function! This TOP OF THE LINE formula gives you the absolute BEST way to support healthy hormone levels during menopause... support PMS...as well as support optimum health and cellular function! To get the full benefits of this superb formula - it's important to take the full dose of 7 tablets per day! Vitamin E is an important fat soluble antioxidant which — in its natural form — contains a synergistic balance of health boosting nutrients: in the form of Tocopherols and Tocotrienols. However, the common Vitamin E used in most multi–vitamins — contains only one of the eight compounds - Alpha–Tocopherol. Well, you need a balance of both Tocopherols and Tocotrienols to experience the maximum power of Vitamin E! In fact, Vitamin E without Tocotrienols is like a driving a car with only 3 wheels! By providing you with only 1 of the powerful forms of Vitamin E you need — can you see how regular multi–vitamins are simply not getting the job done to protect your health? Total Balance Women's Premium contains an all–natural form of Tocotrienols and Tocopherols called Tocomin®. This remarkable nutrient — derived from palm oil — contains all four of the potent Tocotrienols and Alpha-Tocopherol needed to get the spectrum of antioxidant support you need from Vitamin E! You may know the benefits of Vitamin B6 - but did you know that it's the much more expensive form of Vitamin B6 called Pyridoxal-5-phosphate that delivers the goods? It's true! This form is scientifically proven most effective and bio-available for your body - that's what you get in every serving of Total Balance Women's Premium! You'll get the right vitamins and nutrients delivered to the right cells... at the right time... in the most absorbable form... at optimum levels for a healthy, new YOU - in every serving of Total Balance Women's Premium! First of all, the large molecule will not pass through the intestinal walls into the blood stream. It's simply too big! Secondly, this molecule can get easily damaged by acid as it passes through the stomach - before it can be released in the upper intestine. In other words, you would get little benefit from this potentially powerful antioxidant in a normal supplement! To create Total Balance Women's Premium - we use only a special reduced glutathione in a low molecular size for maximum absorption. That way you can experience the full benefit of this powerhouse antioxidant! Total Balance Women's Premium contains a special grape seed extract from New Zealand grown grapes! We use grape seed from non-fermented grapes and the nutrients are extracted from the seed with water instead of ethanol. This creates a concentration of fresh grape seed that keeps all active components intact! That means you get the full health benefits of this important nutrient in every serving of our Total Balance Women's Premium! That's why we can proudly say: We are unaware of any other supplement company who invests the time, money and expertise to ensure you get the purest, most bioavailable nutrients available - and you get them all in Total Balance Women's Premium! Without the right amount of minerals, vitamins, proteins, enzymes and amino acids - your body can't function properly. So how do you know you're getting enough of these critical nutrients? Simple... by taking Total Balance Women's Premium! Total Balance Women’s Premium formula contains potent bioavailable nutrients to fuel your cells! Total Balance Women's Premium also contains other lesser known - but highly effective micro-nutrients. However, there are so many of these micro-nutrients - we simply can't list them all here - but you can refer to the ingredients page for full details. Now your cells can tap into these critical nutrients - when they need them - for optimum cell health - thanks to Total Balance Women's Premium! Proteins control virtually all cellular processes. So without available proteins - at the right time - healthy cellular function may not be possible! Thanks to Total Balance Women's Premium formula - you get a synergistic blend of essential as well as non-essential amino acids to support cell repair and regeneration! To top it all, we are one of the few manufacturers to include the amino acid SAMe in our formula. SAMe is one of the most potent and scientifically proven methylating agents that can help defy premature aging of your cells. But this wonder nutrient is rarely included in a multi-vitamin/mineral supplement. Because SAMe is very costly and susceptible to damage from stomach acids - it must be enteric coated for you to experience the benefits. But don't worry - you'll get this cell supporting amino acid - and many more potent nutrients - in every serving of Total Balance Women's Premium! With the right enzymes - at the right time - your body can work WONDERS! That's why Total Balance Women's Premium includes a range of powerful enzymes such as Bromelain, Amylase and Lipase to boost bio-availability of the other ingredients in the formula – and unleash nutrients to your cells. Thanks to our specialized delivery system - Total Balance Women's Premium directs targeted nutrients to the right cells - at the right time. With the special enteric coating - nutrients are protected from stomach acids as they travel to the upper intestine. That’s a crucial element of nutrient delivery success to support a healthy immune system... healthy digestion... reduce free radical damage... support the health of your bones... brain health... and the health and function of your cardiovascular system - and you get it with every serving of Total Balance Women's Premium! You just can't go wrong - if you're looking for a superior and complete nutrient system to give you maximum age-defying power... experience healthy hormonal balance... get relief from menopause or PMS discomfort... and fuel your cells for energy and vitality - Total Balance Women's Premium is for you! Daily Serving: Adult women - 7 tablets. Take 7 tablets first thing in the morning or split into 2 doses, in the morning and later in the day. Take with or without food. Combines well with our Hormone-Support for Her for maximum support with PMS and menopausal symptoms. 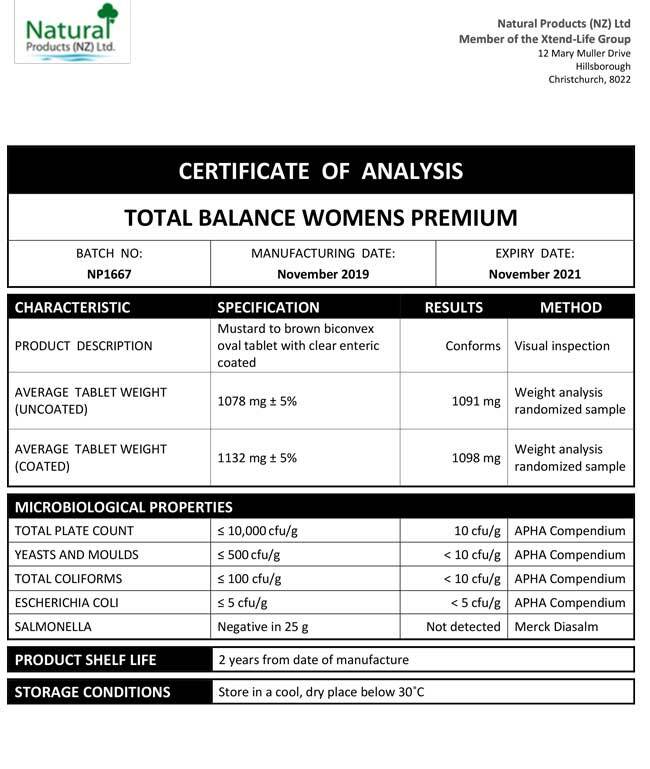 We have included below a copy of a typical Certificate of Analysis (CoA) for our Total Balance Women's Premium product. You will note that there are two columns which are headed 'Specification' and 'Results' respectively. The specifications are simply our minimum standard to which each batch of Xtend-Life Total Balance Women's Premium has to conform, otherwise we would not release it. The results are the actual results from the independent laboratory that did the testing. What does Total Balance Women's Premium do that the standard Total Balance Women's version does not? It does a lot more. Although it contains the same number and amount of female-specific nutrients it goes much further in supporting all the organs and systems, which in turn provides support against the main causes of aging and helping in the prevention of degenerative conditions. To illustrate that better the Premium version contains about three times the amount of SAMe and Resveratrol, both important nutrients. It includes Phosphatidyl L-Serine which targets the brain. There are an additional 7 amino acids included, as well as an immunity blend of another five nutrients and additional anthocyanins for eye health. What is the recommended dosage for Total Balance Women's Premium? The tablet is already at the highest possible level of potency. The reason why the daily dose rate is so high is that it is not physically possible to get the number of nutrients that your organs and systems need in a lesser number of tablets. We use the most potent forms of nutrients to get the maximum ‘punch’ per milligram but in order to achieve the objectives for this supplement and those of our customers, we simply cannot reduce the number of tablets. We accept it can in inconvenient for some people but having the ability to take them all at once without the need for food helps offset that inconvenience. Can I take Total Balance Women’s Premium if I am pregnant or breastfeeding? There is some debate with Doctors on this issue. Some believe it is good, others don’t. We suggest erring on the side of caution and discontinue after the first trimester and switch to a specific prenatal supplement. The only product we recommend during this time is our Omega 3/DHA fish oil, which has valuable properties to support both the health of the mother and baby. Fish oil is highly recommended by many medical professionals during pregnancy and breastfeeding to help support infant brain development, as well as systemic organ growth. It can also play a valuable role in supporting the post-natal mood and brain function of the mother. As the baby draws from the mother's precious stores of DHA, they can easily become depleted, therefore supporting levels with a supplement such as Omega 3/DHA fish oil is very wise. Is it possible that I could feel any negative effects after I start taking Total Balance Women’s Premium? It is possible but unlikely. Some people may experience mild detox symptoms such as nausea, or headaches in the first few days of starting Total Balance products. The likelihood of experiencing these effects will depend on your health status, as well as dietary and lifestyle factors. Total Balance Women’s Premium helps to flush toxins which may accumulate in the body due to a diet high in sugar, caffeine, alcohol, as well as smoking or exposure to environmental toxins. If you consume a less than optimal diet or are exposed to other toxins in your daily life you may well experience some mild detox symptoms. Will Total Balance Women's Premium help to lessen my menopausal/PMS symptoms? Total Balance Women's Premium contains a comprehensive female hormone support blend including ingredients such as Dong Quai, Red Clover Extract and Wild Yam which may help to address the symptoms experienced during menopause and also assist those women suffering from PMS. These ingredients help regulate hormone levels to minimize hot flushes, insomnia, headaches and mood changes. Will Total Balance Women’s Premium interfere with prescription medications? As with all supplements, caution must be taken if you are on medications of any sort. Total Balance Women’s Premium contains ingredients like Gingko Biloba, which help thin the blood, so if you are on blood thinning medication this has to be taken into account. It contains a small amount of Vitamin K which may affect blood clotting as well; if you are taking Coumadin / Warfarin please advise your doctor in case your medication needs to be adjusted. Very rarely there is an issue although it is always a good idea to allow a 2 or 3 hour gap between taking Total Balance Women’s Premium and your medication. Nonetheless, we always suggest checking with your doctor before starting this product. What are the best products to combine with Total Balance Women’s Premium?